Hi Everyone! It’s a rainy day here in NJ but I am reminded that April showers make way for May flowers and in May is Mother’s Day. 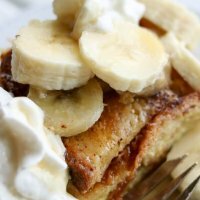 I’ve been thinking about yummy food options for Mother’s Day and I came up with this Banana Caramel French Toast Breakfast Bake. 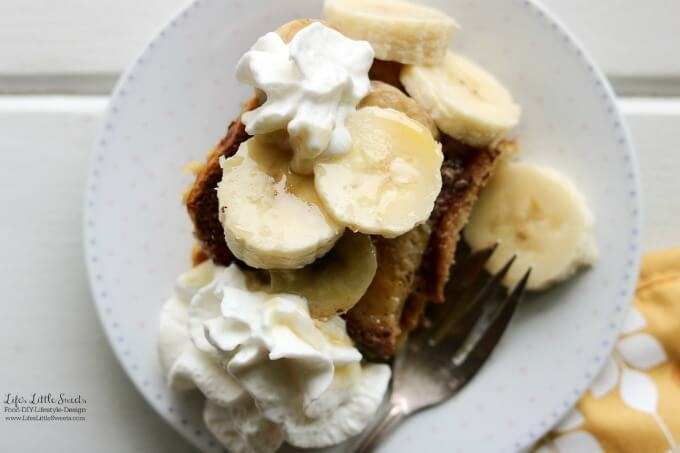 This recipe comes with a way to make it dairy-free. I am always thinking about dairy-free options because my husband Eric is lactose intolerant. 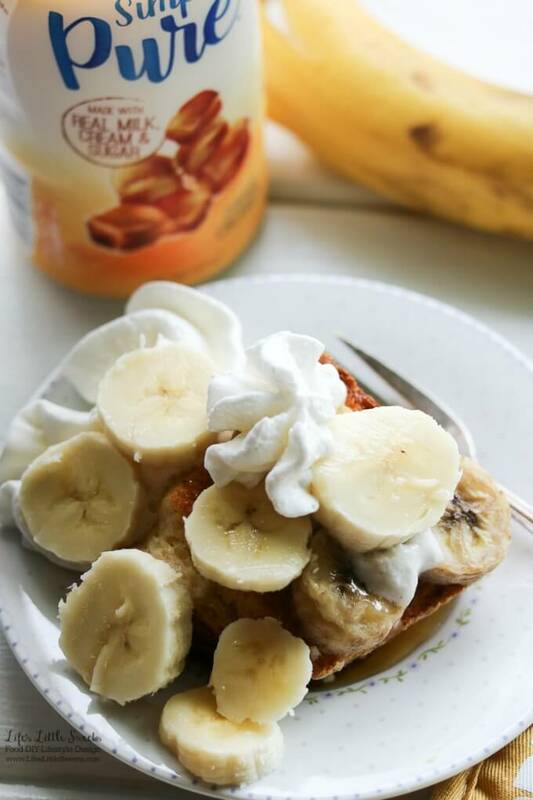 You can use Silk Almond creamer in place of the Simply Pure® Caramel Creamer. You can omit any butter and substitute it with coconut oil. You can also substitute the whole milk for your preferred non-dairy milk. I would suggest almond or coconut milk. 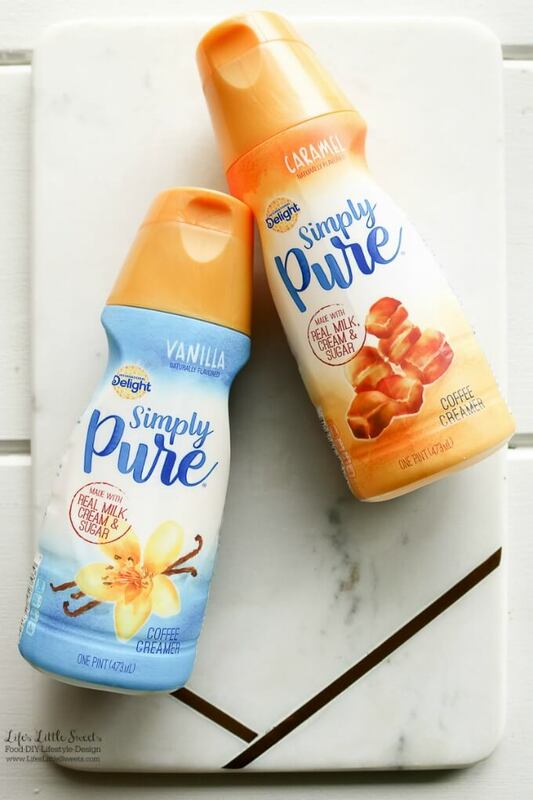 Simply Pure® creamers are made only 5 ingredients and have real milk, cream and sugar and come in 2 flavors: vanilla and caramel. 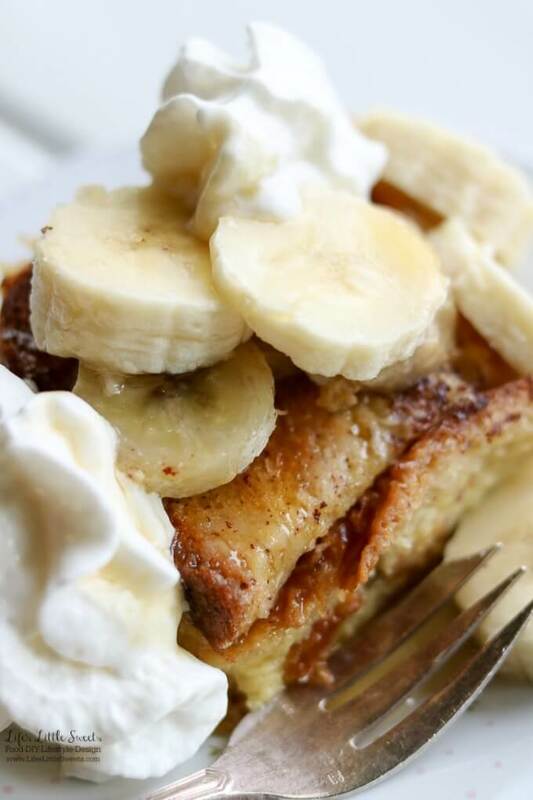 You can serve it optionally with whipped cream (may I suggest my Vanilla Whipped Cream) and maple syrup. 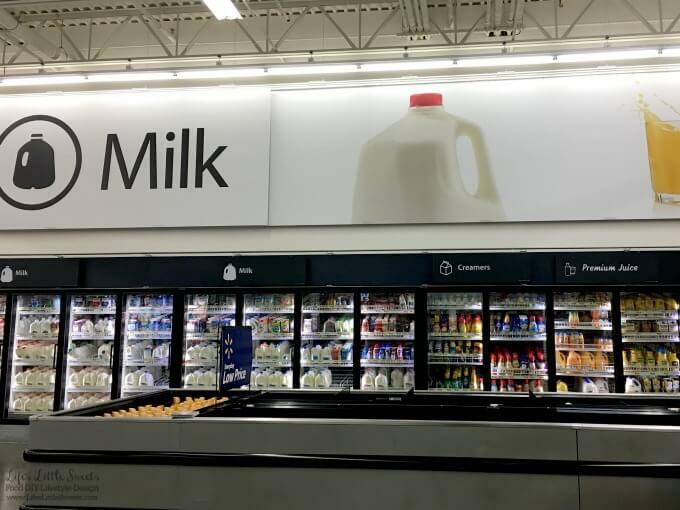 I found Simply Pure® Caramel and Vanilla creamer in the milk section at Walmart (below). 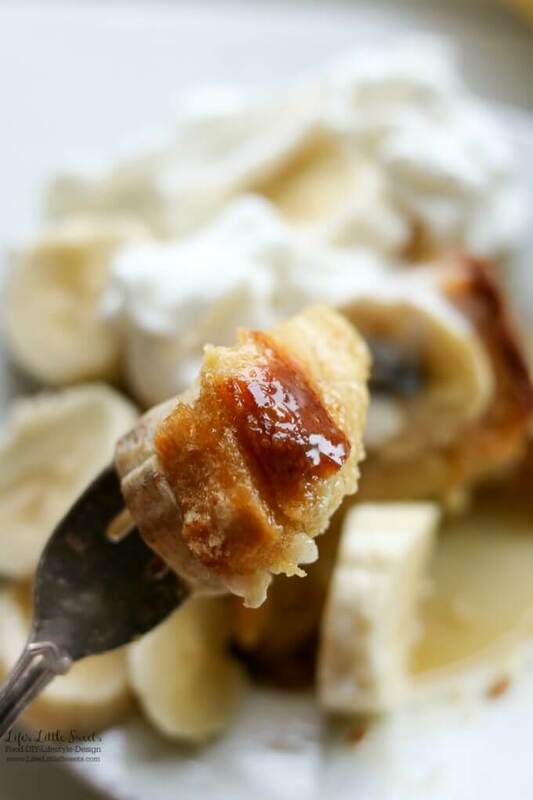 I hope you enjoy this Banana Caramel French Toast Breakfast Bake! Grease an 8 x 8 or 9 x 9 inch baking pan. Slice 1/2 a loaf of bread into squares and layer the pan. You should get 3 layers. 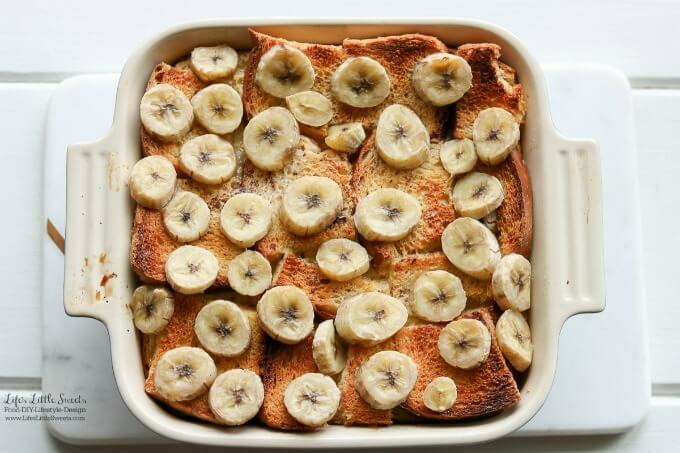 Place sliced bananas over the top (optionally, you can put the bananas in between the layers of bread before pouring the egg-milk mixture). 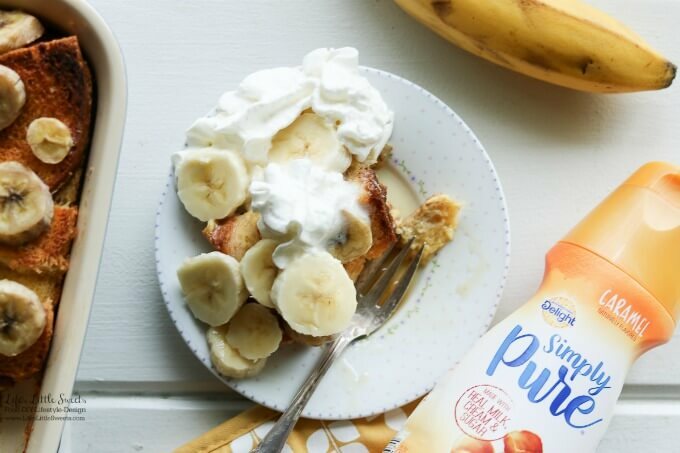 In a large mixing bowl, mix eggs, milk, sugar, creamer, cinnamon, nutmeg, salt, vanilla extract and whisk until combined. Pour mixture over the bread. Place optional 2-3 tablespoons of butter on top. Cover and allow it to soak in the refrigerator for at least 1-3 hours. You can also soak it over night and I suggest that if you are using a dense bread like French bread. Place a foil tent over the baking dish to prevent the bread from browning too much (This can be removed 15 minutes before it's done baking). Preheat oven to 350 degrees F. Uncover baking dish and bake for 40 minutes (don't forget the foil tent!). Check if it's done, if it is still liquid-y in the center, rotate dish 90 degrees and leave in for an additional 15-20 minutes. (I always do the foil tent on most of the way, I do the rotation and the additional 15 minutes. Everyone's individual ovens will vary). When it's done, allow to cool a few minutes and serve warm. 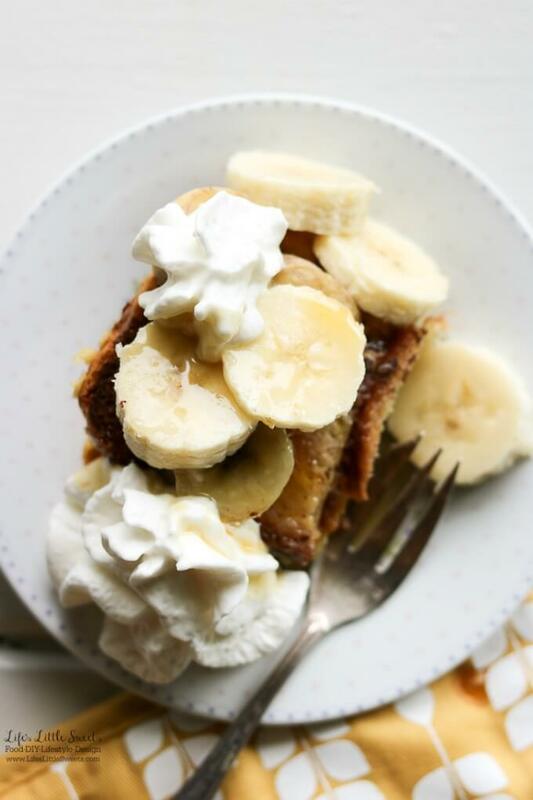 Optionally, serve slices with whipped cream and maple syrup. Enjoy! 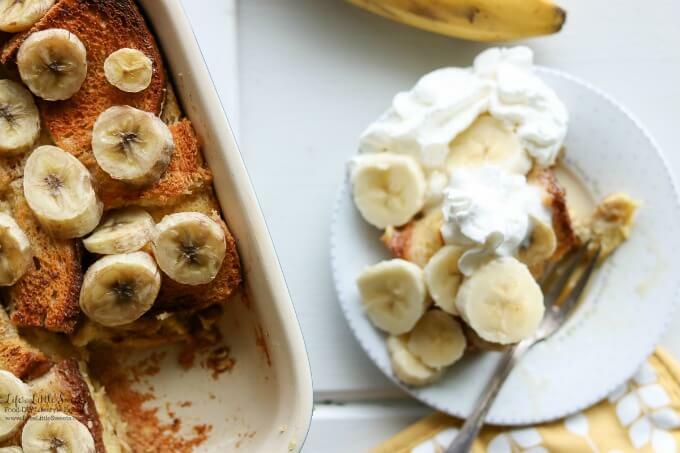 This recipe is inspired by my Baked French Toast Casserole Recipe.